A fundamental element of our Revenue Generation solutions is delivering specialist Lead Management support with the aim of enhancing our Clients’ product sales. 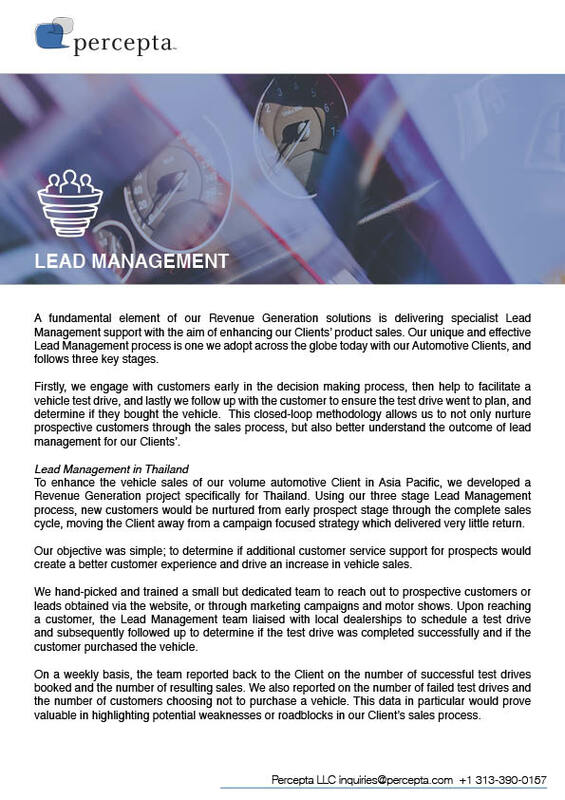 Our unique and effective Lead Management process is one we adopt across the globe today with our Automotive Clients, and follows three key stages. Firstly, we engage with customers early in the decision making process, then help to facilitate a vehicle test drive, and lastly we follow up with the customer to ensure the test drive went to plan, and determine if they bought the vehicle. 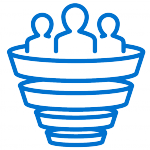 This closed-loop methodology allows us to not only nurture prospective customers through the sales process, but also better understand the outcome of lead management for our Clients’. To enhance the vehicle sales of our volume automotive Client in Asia Pacific, we developed a Revenue Generation project specifically for Thailand. Using our three stage Lead Management process, new customers would be nurtured from early prospect stage through the complete sales cycle, moving the Client away from a campaign focused strategy which delivered very little return. Our objective was simple; to determine if additional customer service support for prospects would create a better customer experience and drive an increase in vehicle sales. We hand-picked and trained a small but dedicated team to reach out to prospective customers or leads obtained via the website, or through marketing campaigns and motor shows. Upon reaching a customer, the Lead Management team liaised with local dealerships to schedule a test drive and subsequently followed up to determine if the test drive was completed successfully and if the customer purchased the vehicle. On a weekly basis, the team reported back to the Client on the number of successful test drives booked and the number of resulting sales. We also reported on the number of failed test drives and the number of customers choosing not to purchase a vehicle. This data in particular would prove valuable in highlighting potential weaknesses or roadblocks in our Client’s sales process. Over the course of the program, the team not only enhanced vehicle sales, but through liaising with the dealer network and following up with customers, they were able to strengthen the dealer-to-brand relationship and drive both customer and dealer satisfaction in Thailand.